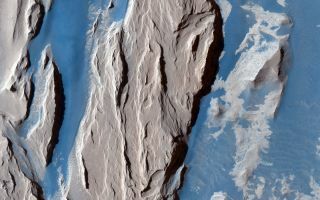 The Medusae Fossae on Mars, as seen by the Mars Reconnaissance Orbiter, with the bedrock colored beige and the sand colored blue. The Opportunity rover on Mars is trying to survive a massive dust storm that could put the craft out of operation — but where does all the dust in that storm come from? Researchers now think they have identified the main source of Martian dust bunnies: a giant volcanic gash across the planet's surface called the Medusae Fossae, according to a new study. And it's quite a lot of pollution. Scientists have calculated that about 3 million tons (3 trillion kilograms) of dust moves between the surface and atmosphere of Mars each year. That makes the phenomenon a crucially important characteristic of the Red Planet's surface. The sheer volume of dust encouraged scientists to track down the material's source. First, the scientists looked at the chemical fingerprint of dust analyzed at a variety of sites around the planet. Weirdly, that fingerprint looks much the same no matter where the sample comes from, with a very specific balance of chlorine and sulfur. So, the team behind the new research went looking for that same ratio in different rocks of Mars itself. Of the regions the scientists looked at, the best match for the dust came from Medusae Fossae, a giant gash near the Martian equator that scientists think was originally created by volcanic activity. The region stretches across almost 620 miles (1,000 kilometers), according to NASA. Previous researchers had suggested that volcanic activity produced the formation about 3 billion years ago and that the ridge-like shapes on its surface come from wind eating away at the surface. The research team estimated the amount of dust that such a process would produce, given how large they believe Medusae Fossae was at the beginning — about half the size of the continental U.S., according to previous research. That calculation suggests that the formation has lost enough dust to coat the planet in a layer from 6.5 to 40 feet (2 to 12 meters) deep. And that estimate matches pretty well with how much dust scientists see on the planet: about 10 feet (3 m), based on measurements of the poles and a few particularly dusty regions, the team wrote. The new research won't help Opportunity endure the dust storm threatening the rover's solar-power supply, but the finding does explain a hugely prominent characteristic of the Red Planet. The research is described in a paper published July 20 in the journal Nature Communications.